Despite some early season concerns that 2016 might be a dry year, no one is talking about lack of moisture now as western Canadian farmers head into harvest. Producers contacted for the late-August Farmer Panel report everything from excessive moisture bordering on a wreck to just about perfect conditions with “exceptional” looking crops depending on what farm you are on. 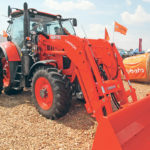 Some producers report frequent but timely rain to produce what’s looking like average to above-average yields, while others talk about major rain events — the tap turned on in July and never shut off — and are preparing for the best salvage job they can manage. And in true farming spirit, no one is sounding smug about the prospects of a decent harvest ahead, or on the other hand feeling self-pity for excessive moisture. 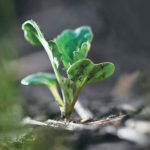 Mother Nature calls the shots, she plays no favourites, and depending on the year all producers have been on one side or the other of these growing season conditions. Here is what farmers said about their plans for 2016 harvest season. Mark Pawluk, at Shoal Lake, Man., is crossing his fingers that there will no more rain for a few weeks and he’ll be able to get onto his fields. 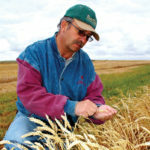 Mark Pawluk is crossing his fingers there will be no more rain for a few weeks and he’ll be able to get on fields and harvest a reasonable-looking crop on his southwest Manitoba farm. While crops are suffering to some degree from water damage, he knows it could have been worse. If the rain holds off, his biggest concern will be to minimize the number of times he gets stuck trying to get it combined. 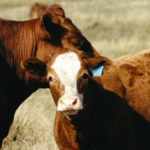 Kendall Heise, another south-central Manitoba producer, says he feels fortunate conditions in his area had dried up a bit over the past three weeks (late July to early August). Hiese says about 10 per cent of his pea crop was likely lost. The soybeans appear to be making a comeback after the rain. And over the next week to 10 days he planned to apply a preharvest treatment to cereals, and swath some canola that “looks pretty good, but not a bumper crop.” He had planned to try straight cutting some canola but the crop was looking “pretty flat” in places. He may wait until next year. And this was the first year Hiese had tried a split application of nitrogen on wheat. He applied an average level of fertility at seeding and then top-dressed liquid nitrogen at mid-season. He was anxious to combine the check strips to determine if the split application made a difference. 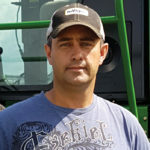 Further west at Tisdale, Sask., Kris Mayerle figured they had lost about 10 per cent of their seeded crop to excessive moisture and he had revised earlier expectations of an above average crop to now more average yield. “Particularly since the middle of July we’ve had a lot of rain,” says Mayerle who is part of a family-run pedigreed seed and commercial crop farming operation. Between July 12 and 15 they had about seven inches of rain in his area, and again in early August some parts of the farm got a 1.5 inch rain while other parts up to 3.5. Over the next week to 10 days he planned to desiccate crops and swath canola and he figured the early barley and oats would be ready for combining within 10 days to two weeks. He had put tracks on a couple of combines for the 2015 season and he was getting them outfitted again for the 2016 harvest. It isn’t a good harvest outlook at the Gust farm at Davidson, Sask. north of Regina. Gust says his canola really isn’t looking all that bad, but since the price was down earlier in the year he had cut back on canola acres, so he doesn’t have that much of it. He had swathed some winter wheat he was planning to combine for seed, but the swaths had received a couple of rains, so he’ll have to see what the quality is like. As conditions stayed wet, Gust had serviced the combine headers and got the skid plates in place. “The equipment needs to be ready when you’re combining lentils in the mud,” he says. 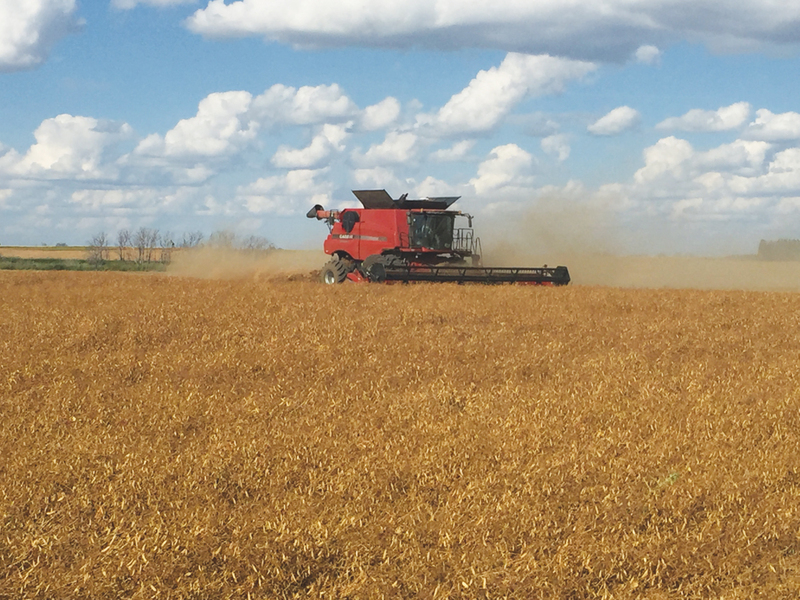 In west-central Alberta, Jason Lenz says his farm dodged a few bullets this year to produce a “lovely” crop of grains and oilseeds. “We didn’t have the excessive rain storms and no hail this year either,” says Lenz who farms with family members near Bentley, west of Red Deer. He said they had occasional rainfalls which delivered about 11 inches of rain over the growing season. At times it was borderline dry and then it would rain. Lenz expected to be combining malt barley in about two weeks — toward the end of August. Since he hasn’t owned a swather for several years, Lenz will continue to straight cut canola. “Our crops are looking fantastic,” he says. He expected the peas would be ready for harvest in about two weeks, and this year he will swath about half his canola and straight cut the other half. North of Edmonton, Colin Felstad says he can’t complain about crop conditions either. Felstad says there was some increased insect pressure during the growing season, but there didn’t appear to be serious losses. He expected to soon be desiccating peas and applying a preharvest treatment on wheat. He should be combining in a couple weeks. He will try straight cutting part of his canola crop to see how that goes. And he applied Manipulator plant growth regulator to wheat this past season. Treated acres appear to be about five inches shorter than those left untreated. Felstad left some check strips so he can evaluate benefits of the treatment. 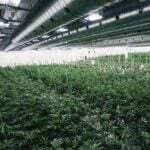 Charles Schmidt says they had “close to perfect” growing conditions” this season. It’s a different story on the Schmidt farm in the normally dry Special Areas region of eastern Alberta. “I’d say we had close to perfect growing conditions and we just have a beautiful crop,” says Charles Schmidt, who is about to harvest his last crop on the long-time family farm at Chinook, Alta. “Normally we are crying the blues in this area because it is too dry, but I probably have one of the nicest lentil crops we’ve ever had. And the soft white wheat is looking perfect.” Schmidt says they had about 12 inches of rain over the growing season. The Schmidts, who have been cropping about 10,000 acres in a crop/fallow rotation for many years, have sold the farm at Chinook and plan to relocate to a smaller more intensive farming system at Davidson, Sask. In light of the excessive moisture conditions in central Saskatchewan in recent years, Schmidt says he may be moving from one extreme to another, but in the long run he figures he will find more consistent crop production on a smaller land base.